I’ve got both ends sewn so far, so I’ll show it all sewn up next time. I also got as far as choosing some pieces to cut up for piecing together, probably also for book covers, though maybe bags since I bought a load of zips with that intention. I just hate sewing zips! Any tips for secure closures which doesn’t involve zips or magnets? I’m leaning towards lobster clasps and D rings at the moment. I like delrin clips but making the felt straps is so time consuming. 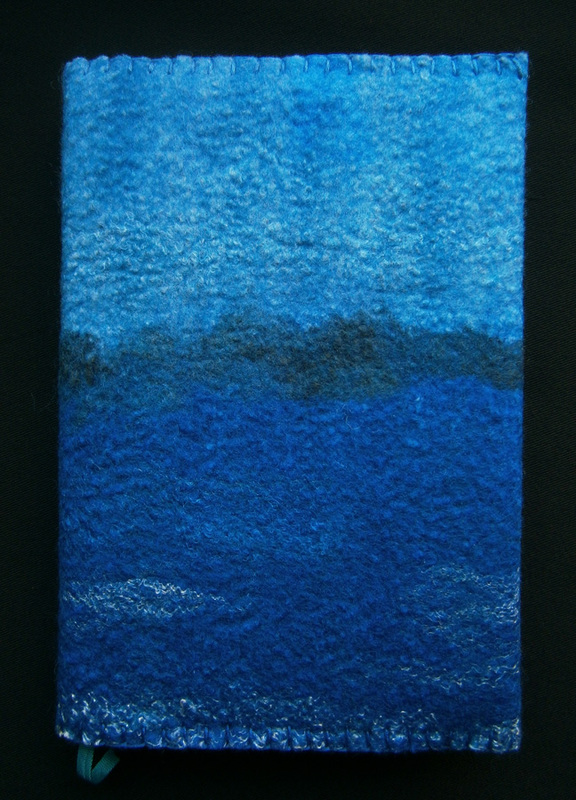 This entry was posted in Made From Felt and tagged felt book cover, sewing felt, wet felting. Bookmark the permalink. As for closures, have you ever considered just having a felt “cord” to knot over a surface and close the book/bag? I think eating ice cream definitely counts as being productive. 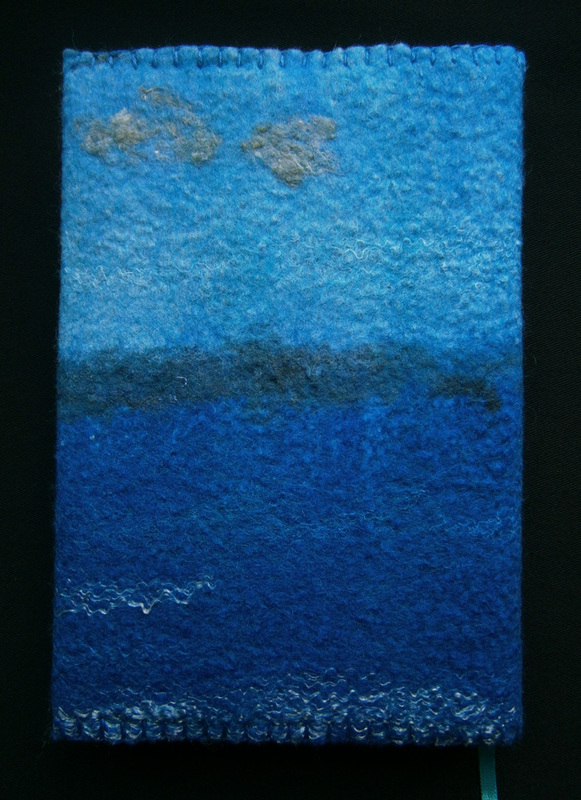 The seascape is wonderful and I like the challenge piece too. Best of luck on the craft fair. I think your idea of creating things you enjoy is the best route. It is a lot more fun, nothing worse than feeling a bit resentful at doing something you’re meant to like! 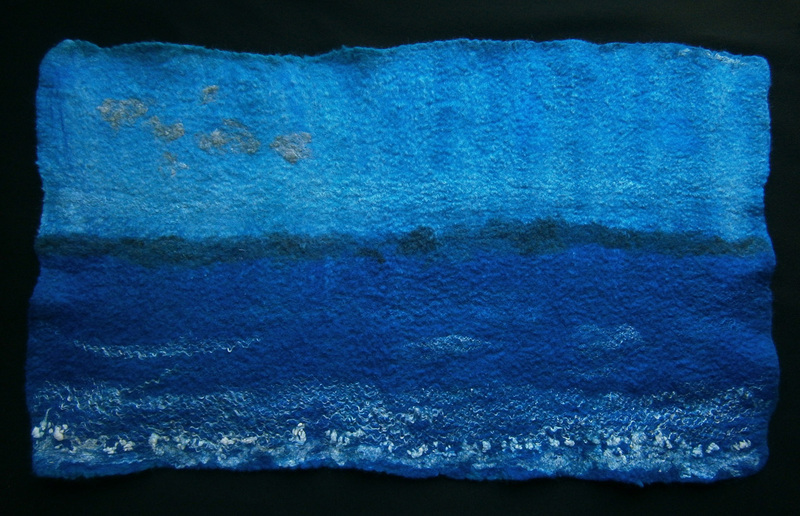 The seascape is a seller! 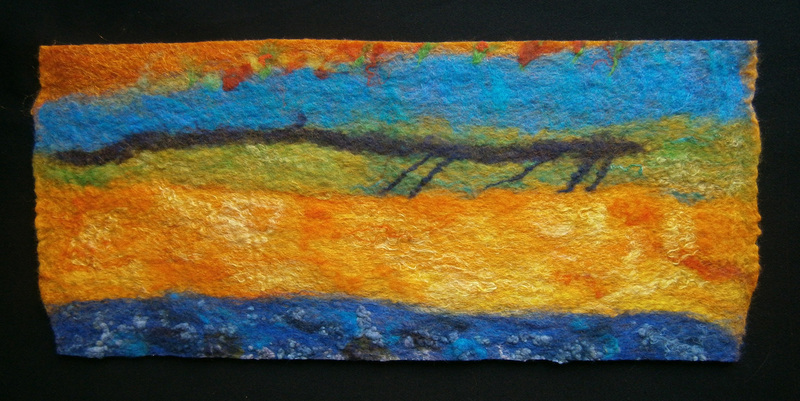 The piece you showed under it will make a seller too – lovely colours. Good luck working through the pile of pretty pieces whatever you decide to make with them. 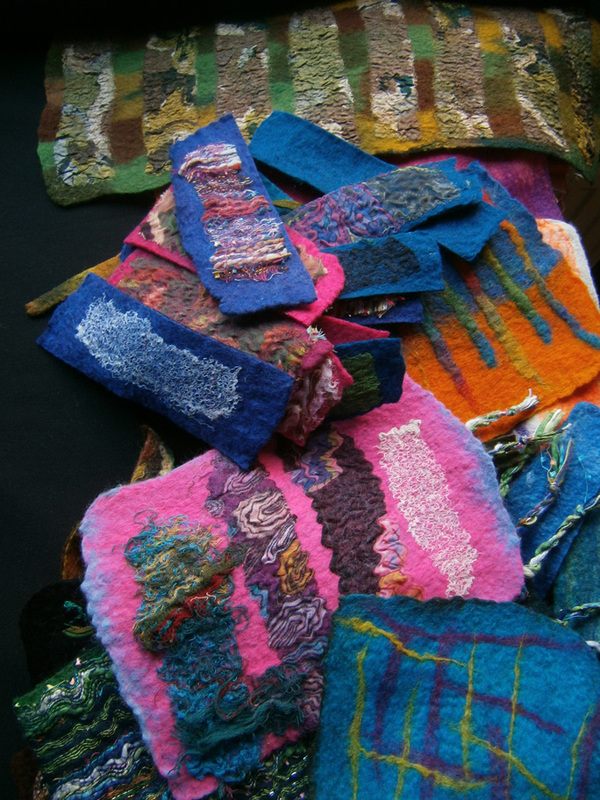 It really is too hot to work with textiles – clammy hands aren’t much use. I’m sitting in my craft room with the curtains drawn tight against the sun, the fan on turbo, all doors and windows in the house open to encourage what little breeze there is at times, and the thermostat unit in the room reads 29C. It’s much cooler in here than outside though – not a day for sitting out! I get hot just looking at wool! Our house has been dark with all the curtains shut against the sun too! I gave in the other day and got my machine out, I thought – there’s no way I won’t be sweating and miserable even if I sit still, so why the heck not?! Early morning and late evening is the only time I can be active, I’m thinking of taking a siesta. I was hoping after we had a bit of rain yesterday it’d be cooler today, but the sun came out again and now it’s just hot and stuffy! I did a craft fair at the weekend, and whilst the takings were healthy and ‘normal’ I sold only a lot of three things which was a first, and they were cards, pincushions and your beloved soaps!! nothing else. You need to learn to love them Zed! 😉 Good luck. You can never second guess what will be popular, can you? Apart from soap of course! I’d better get cracking on some tonight if I want them properly dry by next Saturday! Lovely book cover and book covers-to-be. Gorgeous colours. I don’t like soaps either – I wouldn’t want to use them. I’ve been thinking about bag closures recently though haven’t come up with any major breakthroughs. I like the idea of delrin clips (though I didn’t know that was what they were called). I wonder if you could use webbing instead of felt tabs and stitch it on. I’ve been looking in charity shops at belts and there were quite a few webbing / woven belts available – I was wondering about using them for straps. Belts might also offer other solutions – eg strap buckles that could be adapted, though you can of course buy new closure buckles to stitch on. I might try attaching a closure or strap with a 4mm hole punch & Chicago screws. The most simple option might just be a giant press stud / snap closure – cheap & simple to attach? I’d be interested to hear what you decide. You think just like me! I have a collection of straps and belts, and I’ve bought different kinds of webbing. Oh, and dog and cat leads/collars too! I have a collection of braiding/fancy trim too, but none of it ever seems to match quite as well as a matching felt strap. The braiding looks nice, but is too thin, maybe sewing it onto webbing might work. I didn’t know those buttons wer called Chicago screws, thanks for that! I do like the idea of snaps/press studs, but the trouble I’ve had previously has been them being too strong and pulling at the felt. They might not be the best for bags because of phones too. So much to think about/consider when making stuff! The seascape will definitely be popular. Good luck at the sale. Ah, I’d forgotten about cords and rings, I do have a collection actually, full rings and D rings. In terms of faff, though, I’m thinking loops and buttons, and lobster clasps might be easiest.